“Is it very far from hence?” asked the wolf. So he ran as fast as ever he could, taking the shortest road, but the little maiden took the longest; for she stopped to pluck roses in the wood, to chase butterflies, and gather nosegays of the prettiest flowers she could find – she was such a happy and innocent little soul. The grandmother, who was ill in her bed, said, “Very well, my dear, pull the string and the latch will open.” The wolf pulled the string – the door flew open; he leaped in, fell upon the poor old woman, and ate her up in less than no time, tough as she was, for he had not tasted anything for more than three days. 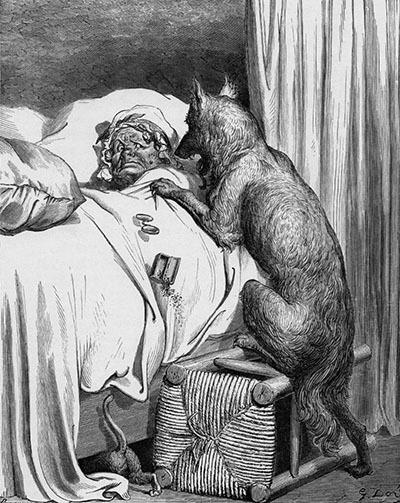 Then he carefully shut the door, and laying himself down snugly in the bed, waited for Little Red-Riding-Hood, who was not long before she came and knocked, Toc – toc, at the door. 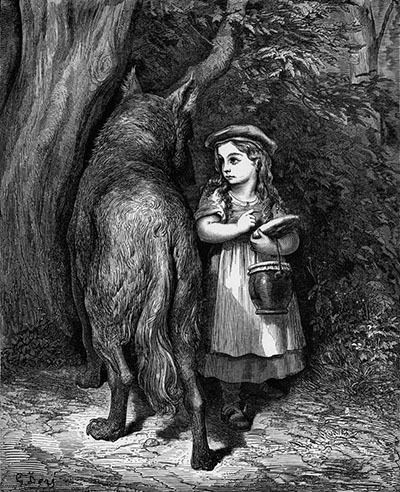 “Who is there?” said the wolf; and the little maiden, hearing his gruff voice, felt sure that her poor grandmother must have caught a bad cold and be very ill indeed. 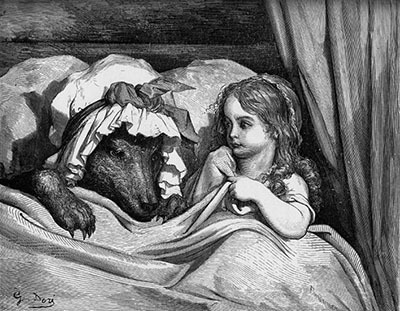 Little Red-Riding-Hood did not think so; but, to please her grandmother, she undressed herself and began to get ready for bed, when she was very much astonished to find how different the old woman looked from ordinary. “That is to eat you up,” cried the wicked wolf; and immediately he fell upon poor Little Red-Riding-Hood, and ate her up in a moment.